Stylish faux suede beds made with recycled materials that are washable & durable. 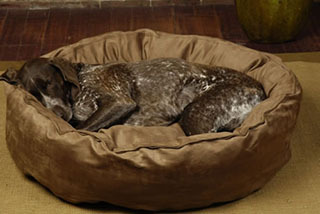 Comfortable, sensible styles that are easy to clean.. Big Shrimpy dog beds are built with the pet, the parent and our planet in mind. They make products that are comfortable and stylish but also easy to wash and dry. Their products are intentionally designed to be durable because they believe that planned obsolescence is an insult to the consumer and the environment. The components in all of their products are washable, dryable and replaceable. If you are tired of wasting money on pet beds that don't last Big Shrimpy dog beds are a great choice!